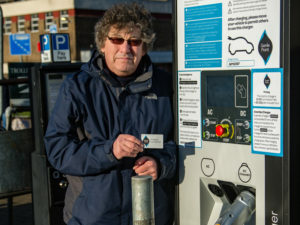 Rushmoor Borough Council has deployed its first rapid charger from ChargePoint, located in the centre of Farnborough, Hampshire. Situated in the Queensmead Car Park in next to the Kingsmead Shopping Mall and Queensmead pedestrian shopping centres, the charger provides 50kW charging for both AC & DC vehicles, accessed via mobile web App or RFID card. The charger is directly connected to ChargePoint Services’ GeniePoint Network, which now has already has 20 rapid and fast chargers for public use.